H.E. Ambassador Khojesta Fana Ebrahimkhel presented her Letters of Credence to H.E. Lassina Zerbo, Executive Secretary of the Preparatory Commission for the Comprehensive Nuclear-Test-Ban Treaty Organization (CTBTO-PrepCom). 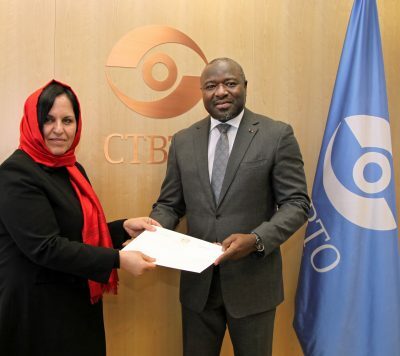 The Ambassador now also serves as Permanent Representative to the CTBTO-PrepCom, an independent international organization within the UN family, having signed a Relationship Agreement with the UN in 2000. The Comprehensive Nuclear-Test-Ban Treaty (CTBT) was created to guarantee a world free forever of nuclear testing. Afghanistan fervently supports this goal and signed and ratified the CTBT in 2003 and continuously promotes the entry-into-force of the Treaty, which needs to be signed and ratified by 44 specific nuclear technology holder countries, with 8 of them still pending — hence the appendix “Preparatory Commission”. Nonetheless, the CTBT has already created a de facto norm against nuclear testing: While more than 2,000 nuclear test explosions were carried out between 1945 and 1996, including in the neighborhood of Afghanistan, only half a dozen tests took place since the CTBT was created in 1996. Afghanistan has profited from the organization’s training workshops and similar programmes for stakeholders from developing countries. Furthermore, the International Monitoring System of the CTBTO-PrepCom can also be used for civilian purposes, such as early-warning in the event of earthquakes and similar natural disasters. Ambassador Ebrahimkhel and the entire team at the Permanent Mission look forward to strengthened cooperation between the CTBTO-PrepCom and Afghanistan. H.E. Ambassador Khojesta Fana Ebrahimkhel presented her Letters of Credence to H.E. Yury Fedotov, Director General of the UN Office at Vienna (UNOV), introducing Madam Ambassador as Permanent Representative. 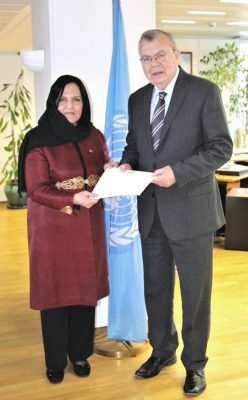 Afghanistan closely cooperates with the UN programmes based in Vienna, including UNODC, INCB, SE4ALL, UNCITRAL and the Vienna offices of IOM, UNHCR and UNODA. As of 2018, Afghanistan will be a member of the Commission on Narcotic Drugs (CND) and the Commission on Crime Prevention and Criminal Justice (CCPCJ), two functional commissions of ECOSOC and administered by UNODC. UNODC has also rolled out numerous projects for Afghan stakeholders over the past 15 years. The INCB is an independent expert body that promotes Governments’ compliance with the international drug control conventions, while ensuring availability of narcotic drugs and psychotropic substances for medical and scientific purposes. The SE4ALL works to accomplish universal access to sustainable energy, bringing together partners from the governments, private sector and civil society. UNCITRAL promotes world trade by harmonizing national regulations and removing certain obstacles to the flow of international trade. The Permanent Mission of Afghanistan in Vienna proactively engages with all Vienna-based organizations towards progress in Afghanistan and implementation of the 2030 Sustainable Development Goals (SDGs). H.E. Ambassador Khojesta Fana Ebrahimkhel presented her Letters of Credence to H.E. Ambassador Thomas Greminger, Secretary General of the OSCE. 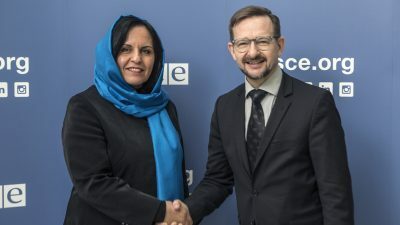 In her capacity as Permanent Representative to the OSCE, Madam Ambassador will foster and strengthen the excellent co-operation between Afghanistan and the OSCE, the world’s largest regional security organization, which is rooted in the 1973 Conference on Security and Co-operation in Europe (CSCE, Helsinki Final Act 1975), renamed to OSCE in 1995. Afghanistan joined the OSCE as a Partner for Co-operation in 2003, enjoying a special relationship with the organization, manifested by a large number of programmes and projects for Afghan stakeholders and declarations, which emphasized OSCE’s engagement with Afghanistan. The people of Afghanistan benefit from the OSCE’s expertise and practical work on the ground: stimulation of the economy; regional connectivity; empowerment of women; freedom of the media; election support; addressing violent extremism; to name but a few. No effort will be spared to make full use of the offerings of the OSCE to accomplish sustainable progress in Afghanistan. H.E. Ambassador Khojesta Fana Ebrahimkhel presented her Letters of Credence to H.E. Martin Kreutner, Dean and Executive Secretary of the International Anti-Corruption Academy (IACA), based in Laxenburg/Lower Austria. Madam Ambassador now also serves as Permanent Representative of the I.R. 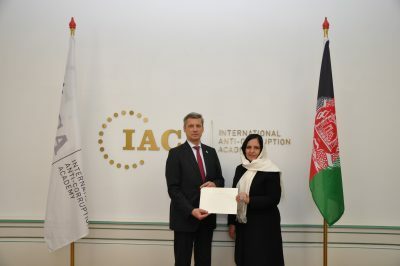 of Afghanistan to IACA, which was established in 2010. Afghanistan acceded as a Party in 2013 and the Permanent Mission in Vienna is actively engaged in facilitating participation of Afghan stakeholders in IACA’s academic programmes and anti-corruption trainings. As an internationally renowned centre of excellence in anti-corruption and compliance, IACA provides essential capacity-building tools towards prevention and elimination of the global menace of corruption. The Permanent Mission shall make every effort to further advance our great collaboration with IACA and to provide additional opportunities for Afghan students, officials, and professionals from the private sector. Today, H.E. Ambassador Khojesta Fana Ebrahimkhel presented her Letters of Credence to H.E. Yukiya Amano, Director General of the IAEA, introducing Madam Ambassador as Resident Representative of the I.R. of Afghanistan to the IAEA. 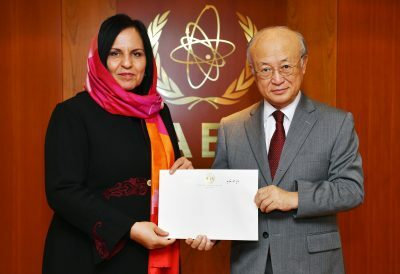 Afghanistan was a founding member of the IAEA in 1957 and has enjoyed a very fruitful cooperation with the Agency ever since, benefitting from technical assistance and cooperation in terms of nuclear and radiological applications in many areas, ranging from cancer treatment to food security and potable water. We look forward to a renewed impetus in our excellent collaboration with the IAEA, for the benefit of the people of Afghanistan.